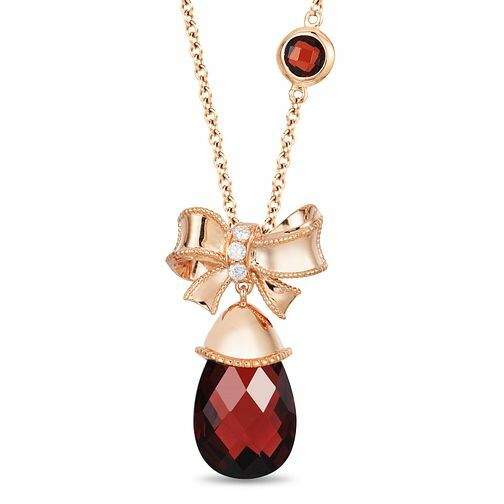 She'll treasure this delightful diamond and garnet bow pendant from the Enchanted Disney Fine Jewelry collection inspired by Snow White. Fashioned in precious 9 carat rose gold, this bold sculpted design features a sweet bow accented with sparkling diamonds at its centre. A teardrop shaped garnet stone drops below the sculpted bow to complete this sweetheart choice. Radiant with diamonds, deep red hued garnet stones and a brilliant buffed luster, this magical pendant suspends along a rose gold cable chain with a spring-ring clasp.